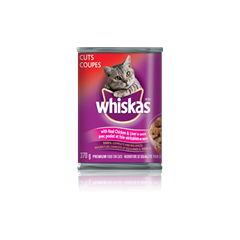 Indulge your cat's sense of taste with WHISKAS® Cuts®. We know that cats are carnivores and crave animal protein just like big cats in the wild. We also know that wet food is an important part of a cat's diet. 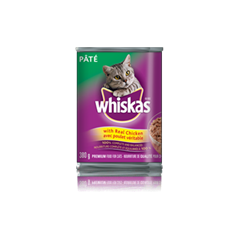 That's why we've created WHISKAS® cans with hearty chunks containing real meat, poultry or fish, slow-cooked in rich gravy - an indulgent meal you can feel good about serving. POULTRY, MEAT BY-PRODUCTS, BEEF, WHEAT FLOUR, CHICKEN, WHEAT PROTEIN, NATURAL FLAVOUR, GUAR GUM, SODIUM TRIPOLYPHOSPHATE, SALT, MINERALS & VITAMINS, SODIUM ALGINATE, COLOUR, XANTHAN GUM, TAURINE, DL-METHIONINE, SUFFICIENT WATER FOR PROCESSING. 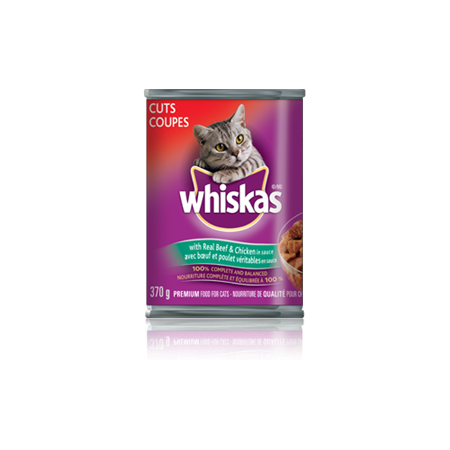 WHISKAS® Cuts® with Real Beef and Chicken is formulated to meet the nutritional levels established by the AAFCO Cat Food Nutrient Profiles for All Life Stages. Feed adult cats 1/3 can per 3.6kg (8 lb.) body weight, twice daily. Feed pregnant and nursing cats 2 to 3 times their normal amount. Feed a kitten up to 2/3 can per feeding, three times a day.